Lacy's artwork is shown here to allow you to view and appreciate her work. Please do not steal it for use on other web sites, flyers, business cards, or other places. If you wish to use Lacy's artwork in such ways, see "About the Artist" below for information on how to contact Lacy to obtain permission. This drawing was inspired by Lacy's dance teacher, Ruby Jazayre, and Ruby was one of the first dancers that Lacy drew. Lacy Chenault is an artist currently living in Indiana with her husband and son. Drawing belly dancers is a great passion of hers that all started with her sister, who had been belly dancing and encouraged Lacy to join a beginners class. She asked Lacy to do a drawing of her belly dancing and it took off from there. 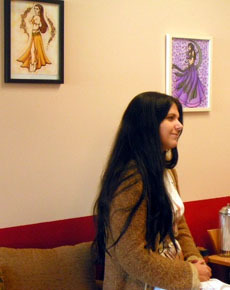 Lacy has drawn her sister, her belly dance teacher, her classmates, and some belly dancers all over the world. The Belly Gallery is always growing, as Lacy is inspired by so many things and people - there is also a "Zodiac Dancers" gallery featuring belly dancers based on the signs of the zodiac. 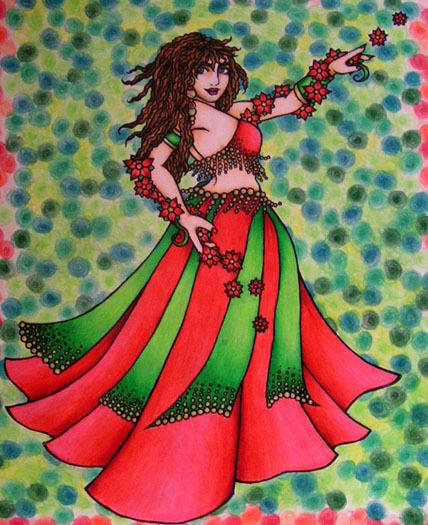 Lacy Chenault's Belly Dancer art can be found on many products ranging from greeting cards and ornaments to t-shirts and posters. The belly dance art products can be found in her two online shops www.zazzle.com/lacychenault and www.cafepress.com/lacychenault If you would like to inquire about using Lacy's art on flyers or business cards please contact her through her website www.lacychenault.com.